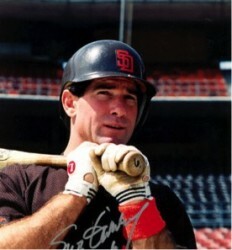 Steven Patrick Garvey (born December 22, 1948 in Tampa, FL) is a former Major League Baseball first-baseman for the Los Angeles Dodgers and the San Diego Padres. Garvey holds the National League record for most consecutive games played (1207). Steve was a 10-time NL All-Star, and the 1974 and 1978 All-Star Game MVP. 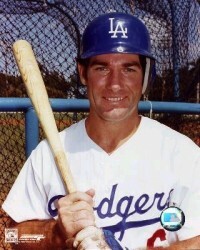 Garvey was on the 1981 Los Angeles Dodgers World Series championship team. He was noted for both his offensive and defensive abilities. 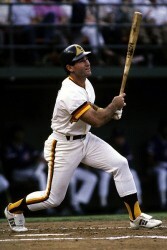 Steve won four consecutive Gold Gloves from 1974 through 1977. He was also the 1974 NL MVP. A career .294 hitter, Garvey has 2,599 hits and 272 home runs in his 19 years in the Major League. His number 6 is retired by the San Diego Padres.